Zylkène is a complementary feed for horses which contains a natural product, derived from casein, a protein in milk. It is a molecule well known to promote the relaxation of newborns after breastfeeding. Launched in April 2008, Zylkène has become a familiar product for veterinary surgeons, behaviourists, nurses and pet owners for use in helping pets cope when facing unusual and unpredictable situations or before occasions such as a change in their normal environment. 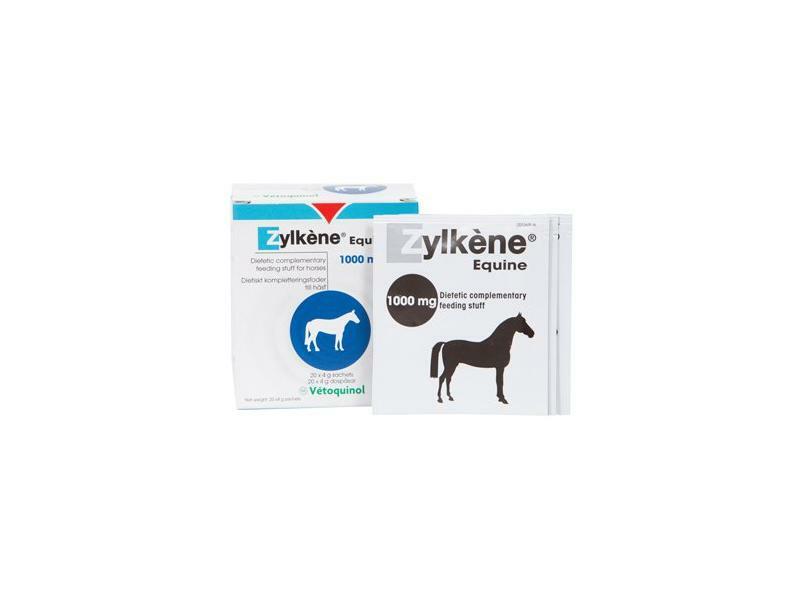 Zylkène is a product that can help support dogs, cats and horses in situations where they find the need to adapt their behaviour to cope. These include competing, travelling, clipping, hacking out or any situation that stresses your horse. There are many ways our pets can respond to new and unpredictable situations and not all animals respond in the same way. Zylkène is palatable and easy to give; simply mix with food. Give just once a day. Short Term Use: use for 1-2 days before the predicted event or change in environment. Some animals may need earlier supplementation (5-7 days). Horses are often dosed for 2 days prior to a particular event, as well as on the day itself. Longer periods can be given, up to permanent, daily supplementation. Below are some recent questions we've received regarding Zylkène Equine, including answers from our team. Is there a tablet form of Zylkene I can give my horse? She won’t eat powered substances. Unfortunately Zylkene does not come in tablet form, it is only in sachets of powder. What is in this product (Zylkene)? Alpha-S1 Tryptic Casein- an ingredient derived from a milk protein which has calming properties. In an apple flavoured powder. I was just wondering if this product is FEI legal in eventing. Zylkene is not on the FEI's banned substances list so is not tested for. However, any calming or performance-enhancing agent is not allowed, according to FEI regulations.